There’s a particular poignancy to abandoned rural equipment. Whenever I see a plough, cart, ripper, or tractor rusting away in a paddock, I wonder about its working life. Who bought it, when and why? Where was it made and how did it get to its final destination? Was the owner filled with optimism when they built or acquired it? Did it represent a significant financial commitment and, if so, did it repay that effort or outlay? Why was it left to rot or rust? Some part of the history of Australian rural endeavour is embedded within each relic. But provenance – the object’s biography – is lost if there is no longer anyone who knows the answers to these questions. Sometimes, however, a manufacturer’s plate can also reveal a story. 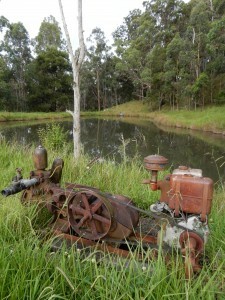 Recently I paid attention to an old pump sitting beside a small dam on a property between Armidale and Grafton. The plate showed that it the engine was a 3.5 horsepower diesel, capable of 1800 rpm, made by Lister in Dursley, England. I haven’t been able to date this engine precisely but it seems to be an “LD” single cylinder model and I’m guessing it’s a post-war make. Established in 1867, Lister was an important part of British agricultural and manufacturing history. Its petrol and diesel engines powered countless machines for dairying, shearing and other work. In 1986 they were merged with competitor Petter Ltd but the name lives on with the Lister Petter engines which are still manufactured in the UK and still painted in the traditional green livery of early Lister engines. Lister also played a big role in Australian agriculture. After 1909 they built shearing machines designed by Australian Jim Davidson. From 1929, when the first Lister 9-1 was built, thousands of their stationary diesel engines were imported and distributed across Australia – especially to dairy farms where moving water was so important. The company embodied the ‘crimson thread of kinship’ that tied Australia to Britain for nearly 90 years after Henry Parkes coined that phrase in 1888. Britain was this country’s major market for primary produce and its major supplier of manufactured goods. While the new Commonwealth Government embraced protection for local industry in the early 1900s, Listers enjoyed the preferential tariff which applied to ‘goods of British origin’ that operated from 1932 under the United Kingdom/Australia Trade Agreement [UKATA]. In return Britain gave preference to Australian produce. The loyalty established within Empire meant a great deal before Britain entered the European Common Market in 1973 which marked the end of UKATA. The 1932 agreement was struck in the worst year of the Great Depression. Competition with British goods made in a larger central market with many more years behind them was surely tough. Lister engines competed with those built by Australian firms such as Kelly and Lewis and Harris Scarfe and Sandovers. There were 153 agricultural factories in Australia in 1915, but only 148 in 1930/31 and 139 in 1935. South Australia was hardest hit. That said there were 4,202 people employed in the industry in 1935 as opposed to 3,606 in 1915 and the output then was nearly £2 million compared to £1,300,000 twenty years earlier. It seems that those firms which survived were productive. When the worst of the Depression had passed, the number of factories increased. There were 161 in 1938. The post war years were better still for agricultural manufacturers in Australia. There 257 factories in 1951, despite competition from the likes of Lister. 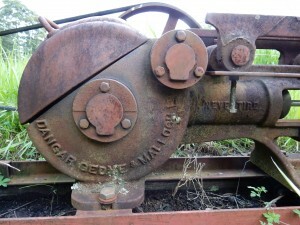 Lister machines were distributed here by a company of equal reputation and even greater longevity, Dangar, Gedye and Malloch [DGM]. That firm was established in 1838 and became associated with Lister in 1909 when they distributed Lister shearing machines designed by Australian Jim Davidson. They had had the agency for Wolseley shearing machines – made in Ultimo / Pyrmont - since 1893. The name Dangar is itself inscribed on our landscape thanks to the patriarch of the family Henry Danger who explored, surveyed and then selected thousands of acres – Dangar Falls and Dangar Island in New South Wales are named after him. By the 1930s DGM had a century of history behind them and declared confidently that they could provide ‘Every machine for the Man on the Land’. Under the management of Robert Malloch, the company survived the Depression and expanded in the post war years – following the pattern of the Australian agricultural machinery industry. Indeed the pump that is hooked up to the aforementioned Lister diesel is a Dangar, Gedye and Malloch ‘Nevertire’ machine. That was the stoic trademark that identified DGM’s own products which, I think, were built in Ultimo. 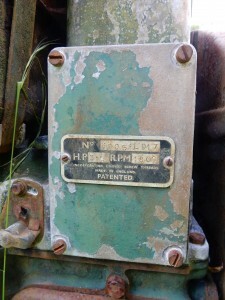 Both the company name and the brand ‘Nevertire’ were proudly cast into the metal casing of the pump. Lister and DGM were family-based firms. Lister was part of the English tradition of paternal capitalism – like Lever Brothers and Cadburys. For his part Robert Malloch epitomised the wise, honest Australian business patriarch. His two sons were also Directors of the company. Despite DGM’s association with manufacturing, Malloch believed Australia’s prosperity was bound up in its primary industries. When he died in 1951, the regional press noted the passing of a friend to the ‘man on the land’. It was no coincidence that both firms were taken over in the 1960s. Then markets, economies and the way of doing business were changing. Hawker Siddeley acquired Lister in 1965 and Frigrite bought DGM in 1961, concentrating on the refrigeration side of the business at the expense of the rural machinery. The trademark ‘Nevertire’ lapsed in 1966. The English-made engine and Australian ‘Nevertire’ pump that caught my eye sit silently side by side. The backstory is lost but they are a reminder both of an Imperial partnership that was once loomed large in Australian agriculture, and of the historical links between this country’s manufacturing and rural industries. A poignant pairing.